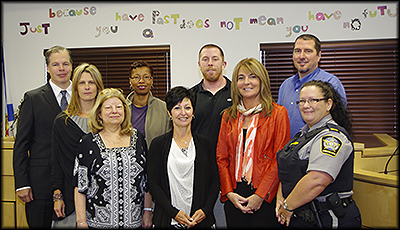 On November 5th, 2014, the Mental Health Court marks five years of operation. More than 200 people who came into conflict with the law because of their mental illness have graduated from the Court's program. They have been helped to get their lives back on track instead of being sent to jail. The Court was established five years ago to deal with people who commit crimes because of their mental illness. It began hearing cases on November 5th, 2009. The very first docket – the list of participants – included five names. Today, 20 to 50 people appear before the Court each week as part of their court-monitored rehabilitation. Some are there for a follow-up appearance. Others are appearing before the Court for the first time. And still others are graduating from the program. To mark this year's anniversary, the Court has released a detailed report on its first four years of work. The report can be accessed by clicking on the 'READ/PRINT" link in the box to the right. In sharp contrast with the adversarial approach of traditional criminal courts, which often leads to jail, the Mental Health Court is a collaboration between justice professionals and mental health and addictions clinicians. Together, they work with the accused to help them connect to services, develop rehabilitation plans, and improve their well-being and living situations in order to decrease their likelihood of reoffending. At the same time, they continuously assess the potential risk the accused may pose the public. Along the way, the Court monitors their progress and can, if necessary, order them back to the regular criminal courts. During the first four years (2009 to 2013) 232 of the total number of people who were referred to the Court were deemed eligible to participate in the Court's rehabilitation program. People facing criminal charges must meet stringent criteria in order to be referred to, and then to qualify to appear before, the Mental Health Court. In order to continue in the Court's program, and eventually graduate, a participant must follow the rehabilitation program developed for him/her by the Mental Health Court Team of professionals in the fields of justice and mental health & addictions. Along the way, the Court monitors the participant's progress and can, if necessary, return him/her to the regular courts. The Team consists of a Crown attorney, a defence counsel (from Nova Scotia Legal Aid), a probation officer, two mental health clinicians, a forensic psychologist, and an addictions social worker. The Court also has available to it consulting forensic psychiatrists who provide opinions in situations where it is unclear to the Team whether a qualifying mental health disorder exists. The Court is overseen by a dedicated Judge. The NS MHC Team’s clinicians, in consultation with the probation officer, complete the eligibility screening for each of the people referred to the Court. The decision to accept an individual into the program is made by consensus after thoughtful, thorough, and frank discussions among the Team members and the Judge. The NS Legal Aid defence counsel supports and advocates on behalf of their clients and provides assistance to the Team. The Crown attorney is involved in determining initial admission for screening as well as addressing ongoing issues that may affect public safety. When a particular individual has complex or unclear symptoms, he or she is referred to the East Coast Forensic Hospital where forensic psychologists and/or psychiatrists are available to provide clarification and/or consultation. This partnership is vital to assisting the Team in the screening, planning, and management of individuals involved with the Court. A large scale independent evaluation began in August 2012 under the direction of Mary Ann Campbell, Ph.D., Director of the Centre for Criminal Justice Studies at the University of New Brunswick - Saint John Campu.Dr. Campbell is working with Crystal Dieleman, Ph.D. (School of Occupational Therapy at Dalhousie University), Jeff Karabanow, Ph.D. (School of Social Work at Dalhousie University), and Margo Watt, Ph.D. (Department of Psychology at St. Frances Xavier University). This evaluation examined the degree to which the Nova Scotia Mental Health Court program achieved its objectives; promoting mental health recovery and reducing repeat offences. The study compares cases that went through the Mental Health Court with cases (also involving mental health issues) that went through the traditional criminal courts.